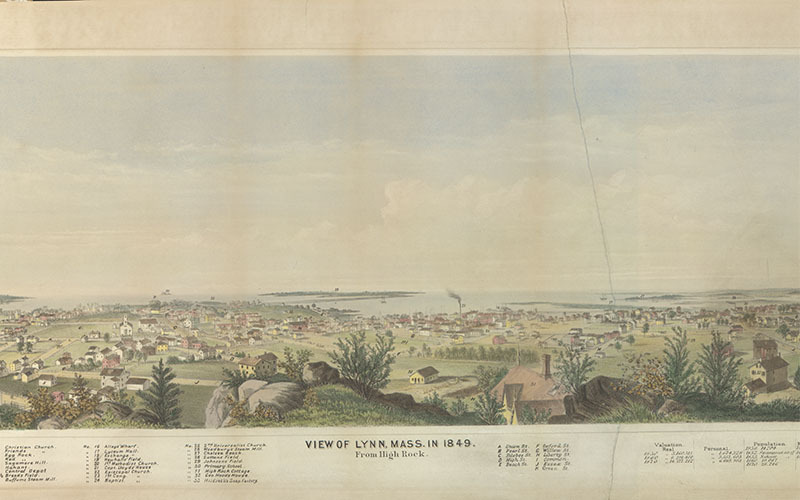 Lynn, Massachusetts, played an important role in the life of Mary Baker Eddy. An event that occurred there in February 1866—in which she fell on an icy street and was severely injured—would lead to her discovery of Christian Science. It was also in this small city north of Boston that she taught her first students and lived for many years, before leaving for good in 1882. We have in our collection a lithograph of Lynn from 1849. Given to The Mother Church in 1982, it never resided in Eddy’s homes, but it does provide an interesting glimpse into the city she would call home for some of the most significant years of her life. Lynn grew a great deal from 1849 through Eddy’s time there in the 1860s and 70s. (In 1849 Eddy was Mary Baker Glover, a 28-year-old widow and mother living with her family in Sanbornton, New Hampshire.) Lynn’s population doubled between 1850 and 1870, from 14,000 to 28,000. The city’s prosperity can be attributed to the residents’ industrious nature and the rise of shoe manufacturing. In fact, many of Eddy’s early students were employed in the shoemaking industry. Many of Lynn’s most striking physical locations remained significant even as the city grew in the mid-nineteenth century. High Rock, from where the original drawing was made, still towered above the city. Egg Rock (numbered 10 on this print) and the town common (letter “I”) still existed. So did Red Rock (11) where Eddy often went for contemplation, a short walk from her house on Broad Street. Of particular note are the buildings the lithographer chose to include in the drawing. The primary designations go to churches—and Lynn had a wide variety of Protestant denominations in 1849. Baptists, Methodists, Congregationalists, Universalists, and Episcopalians (among others) all called Lynn home. It’s obvious that religion played a big role in the lives of the residents, thus making it ripe for interest in Eddy’s ideas. Interestingly, according to Eddy biographer Robert Peel, she attended the Unitarian church in the late 1860s (also known as Second Congregational Society2), although it’s not known why this was not identified on the map. Eddy never forgot the importance of Lynn as the geographical starting point in her life’s work. As she wrote in Science and Health with Key to the Scriptures, “The first school of Christian Science Mind-healing was started by the author with only one student in Lynn, Massachusetts, about the year 1867.”3 From an inauspicious start in this small Massachusetts city, the world would come to know of Mary Baker Eddy and Christian Science. “John H. Bufford,” Smithsonian American Art Museum, accessed September 16, 2016, http://americanart.si.edu/collections/search/artist/?id=6976. Robert Peel, Mary Baker Eddy: The Years of Discovery (Boston: The Christian Science Publishing Society, 2003), 287. Mary Baker Eddy, Science and Health with Key to the Scriptures (Boston: The Writings of Mary Baker Eddy, 1906), xi.